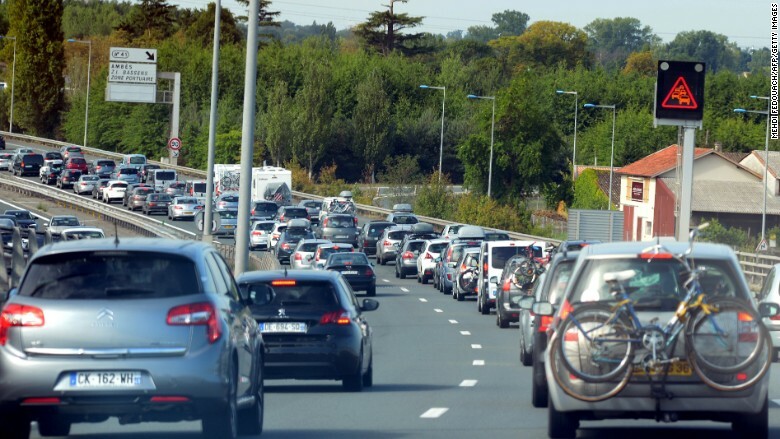 A new ruling ensures European workers who travel regularly will get paid if they get stuck in this kind of traffic. Here's some good news for workers who are constantly on the road. Europe's top court ruled Thursday that employees who have to travel to different sites for their work must be considered 'on the job' from when they leave their homes to when they return. So if a plumber has to travel for two hours to get to his first job in the morning, that driving time should count as part of his working day, according to the court. Same thing goes for his long ride home. The Court of Justice explained that "excluding those journeys ... would be contrary to the objective of protecting the safety and health of workers." Unfortunately for white collar workers, the ruling doesn't apply to typical commuters who travel routinely to the same office. The judgment, which applies to all 28 nations in the European Union, was reached after a review of employment practices at security firm Tyco (TYC) in Spain. According to court documents, Tyco workers who installed and checked security systems in different locations would sometimes drive up to three hours to get to their first appointment. The company had said working hours didn't begin until employees reached their locations. Tyco declined to comment on the ruling when contacted by CNNMoney. Sarah Henchoz, a partner at Allen & Overy who specializes in employment law, said the ruling would have a big impact on companies with a mobile workforce. She warned that some firms may try to get around the ruling -- and the additional cost -- by providing fixed office spaces and requiring workers to check in before they begin their day on the road, thus reducing the amount of paid travel time. One group that is likely to benefit are workers who provide healthcare and social services to people in their homes. Unison, a labor union which represents about 30,000 home care workers in the U.K., welcomed the ruling. But making sure employers comply could be tricky. "It will be quite a challenge to ensure this is followed through on," said Unison spokesperson Matthew Egan.